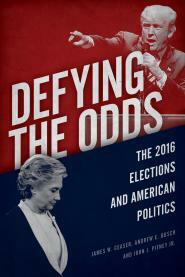 In Defying the Odds, we talk about the social and economic divides that enabled Trump to enter the White House. In Coming Apart, Charles Murray explains why he includes knowledge of military insignia in his famous "bubble test." In the 2000 census, 26.4 million Americans were veterans of the armed forces. In mainstream America, just about every neighborhood is peppered with numerous veterans, and the local chapter of the VFW or American Legion is still a significant civic force in much of America. It’s not only about jobs, income, opioids or even race. It is also about the impact of America’s 21st-century wars, and who has done the actual fighting and dying. America has been at war continuously for over 15 years, but few Americans seem to notice. This is because the vast majority of citizens have no direct connection to those soldiers fighting, dying, and returning wounded from combat. Increasingly, a divide is emerging between communities whose young people are dying to defend the country, and those communities whose young people are not. In this paper we empirically explore whether this divide—the casualty gap—contributed to Donald Trump’s surprise victory in November 2016. The data analysis presented in this working paper finds that indeed, in the 2016 election Trump was speaking to this forgotten part of America. Even controlling in a statistical model for many other alternative explanations, we find that there is a significant and meaningful relationship between a community’s rate of military sacrifice and its support for Trump. Our statistical model suggests that if three states key to Trump’s victory – Pennsylvania, Michigan, and Wisconsin – had suffered even a modestly lower casualty rate, all three could have flipped from red to blue and sent Hillary Clinton to the White House. There are many implications of our findings, but none as important as what this means for Trump’s foreign policy. If Trump wants to win again in 2020, his electoral fate may well rest on the administration’s approach to the human costs of war. Trump should remain highly sensitive to American combat casualties, lest he become yet another politician who overlooks the invisible inequality of military sacrifice. More broadly, the findings suggest that politicians from both parties would do well to more directly recognize and address the needs of those communities whose young women and men are making the ultimate sacrifice for the country.